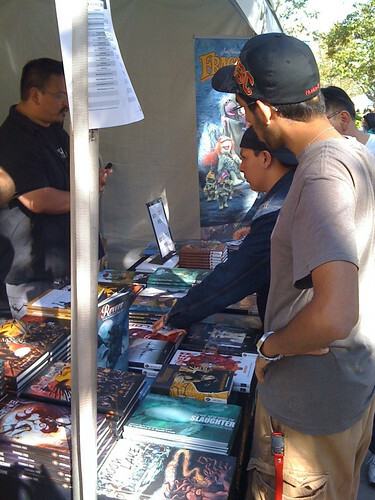 Comic books, graphic novels, manga (whatever you want to call sequential art) was pulling in the crowds at this past weekend’s LA Times Festival of Books, the nation’s largest book fair. After 14 years at UCLA, the free open air event moved to rival campus USC in South LA and it didn’t seem to hamper attendance. The more concentrated layout, and the campus’ access to public transportation seemed to please most attendees. That nitpick aside, all seemed to go well for the most part, and perhaps the most favored part of the Festival was comics. While I was only able to attend over half of Saturday, almost every comics booth and panel I checked in with had a heavy turnout with a good mix of what seemed like a lot of curious newcomers and some diehard (or at least familiar) comics readers. Hi De Ho Comics & Books with Pictures, a longtime store located in Santa Monica, had a very prominent location and a big booth setup (right). This was probably one of the most consistently and heavily trafficked booths we saw on Trousdale and Childs Way. Legendary Archie Comics writer George Gladir, co-creator of Sabrina the Teenage Witch with artist Dan DeCarlo, was signing copies of Archie’s Americana series. He was particularly proud of his name getting credited in the two Best of the Eighties volumes, noting how rare it was for Archie to name the creators at the time. Adults that grew up on Archie and kids that are growing up on Archie now clustered around his table, sometimes making it near impossible to even see him. By the middle of the day, Hi De Ho had sold out of Best of the Eighties Volume 1 and George had to keep asking for the staff to replenish copies of Volume 2. It was also great to see the great diversity of people that were drawn to him, proving that Archie truly is a pervasive American icon. On the other side of the booth, graphic novelist Mark Kalesniko was providing free sketches with purchases of his books, like his latest release Freeway, about that most unique of LA experiences: soul crushing traffic. Yet just from the little I’ve read so far, it maintains such charm and humor with an amazing ability to depict movement and the main character’s emotions, sometimes with no dialogue whatsoever. SLG Publishing was the second booth we discovered, and it kept getting waves of people checking out their great selection of graphic novels, comic books, t-shirts, posters and Ugly Dolls. In addition to their own material, they also had a smattering of graphic novels from other publishers. We easily spent the most money here, which surprised me. Nahleen actually out-spent me at SLG, which might be a first when it comes to comics. Right next to SLG was the Boom! Studios booth, which had a constant mob trying to check out the Disney and Peanuts graphic novels from their kaboom! imprint. Boom! smartly had a buy 1, get 1 free deal going on. Kids and parents alike were asking all sorts of questions about what’s best, what’s age appropriate, and more, and the Boom! staff was great. They clearly love this material too. One kid asked which volume of Donald Duck: Double Duck was best, and the guy responded not as a dry sales person, but as an enthusiastic reader. One somewhat awkward moment came when a mother asked where Boom!’s store was located, so she could buy more at a later date. She had to be informed that there is no store, Boom! sells to other stores. She must’ve sensed it was going to get confusing so she said she would just check out their website, and I suspect she did based on her kids’ eagerness. Fortunately kaboom! has an online store, so I’m optimistic they’ll eventually get what they want. Next stop was the booth for the Comic Book Legal Defense Fund. This was a pleasant surprise, because I didn’t see them listed on the exhibitor list posted on the Festival’s website or iPhone app. The CBLDF provides crucial First Amendment protection to the comic book industry, so it’s great to see them accepting donations and getting the word out about their work in this kind of mainstream venue. Unfortunately not as many people were stopping at their booth. Maybe it needed to be laid out differently, with the tables pushed more toward the front of the tent, or maybe people thought something with the word “Legal” in the title was too boring to even bother. But they had a steady stream of 2-3 people at a time, at least. (One guy abruptly stopped in and asked if there was a way to volunteer to get into Comic-Con, which seemed a little transparently like someone didn’t get tickets to the sold-out convention, but still wanted to go and maybe or maybe not cares at all about the work CBLDF does. But whatever.) They had awesome “I Read Banned Comics” t-shirts for sale, as well as signed copies of some fantastic material all reasonably priced. The web-comic Green Pieces Cartoons had a booth with a great set-up that was constantly pulling people in: a monitor displayed to passers-by artist Drew Aquilina drawing his environmentally-friendly characters. The gag strip has been covered by National Geographic Kids and there was a near-impenetrable wall of people there when I stopped by. A print version of the web-comic was for sale, along with t-shirts and tote bags. Archaia Entertainment had another popular booth (right) with probably the best deal at the festival: buy 1, get 1 free; buy 2, get 3 free. This kind of belief in their product goes a long way and caught some off-guard. There were also a few artists on hand to offer free sketches, like Dave Valeza, artist of the graphic novel An Elegy for Amelia Johnson. It’s great cover design really popped out, and was getting a lot of questions, some from young women. Comparisons to Blankets were made. Mouse Guard and The Killer were also getting a lot of attention (The Killer Vol. 1 had sold out), and Revere got one of the best pitches from publisher Stephen Christy (“The British are coming, but the werewolves are worse”). 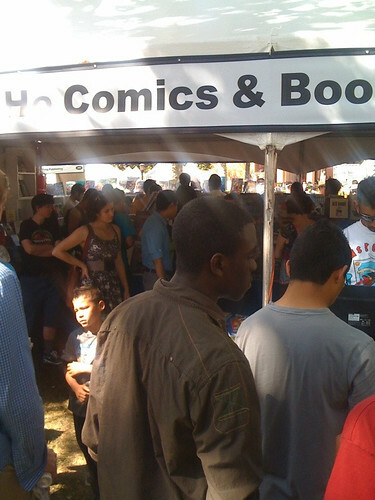 The team-up booth of Wondermark and Sheldon also had a wall of people in front of it. They not only were attracting a lot of interested, but they probably won the Devoted Fans Award. I overhead a young woman tell Sheldon creator Dave Kellett that she had traveled a considerable distance just to see him. The rest of the Festival, indeed the rest of Los Angeles, was apparently inconsequential. These two web-comics have a unique look and their styles are different, so that no doubt explained the big draw. 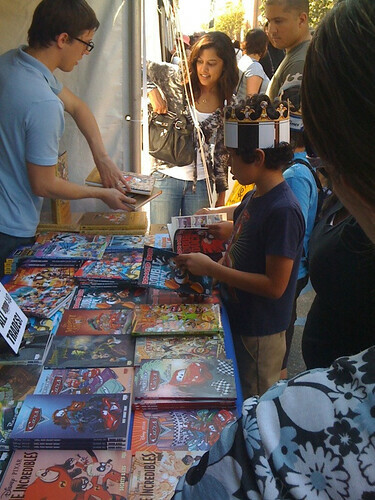 They were undeniably eye-catching, which probably explains why the comics booths in general got so much attention. Graphic design skills pay off. And then the quality substance kept them there. The only panel I was able to make was the Graphic Novel panel moderated by the Hero Complex‘ Geoff Boucher. The panelists were three amazing talents: Daniel Clowes (Mr. Wonderful, Wilson, Ghost World), Dash Shaw (BodyWorld, Bottomless Belly Button), and Jim Woodring (Weathercraft, Frank). The three had a fully engaging and frequently funny discussion about their approach to their art, storytelling, technology, their work environments and more. The panel wasn’t quite sold out but the room was definitely packed within 5 minutes after it started. It was fascinating to listen to creators with such diverse styles and approaches. In 2009, the Los Angeles Times Book Prizes, begun in 1980, added a Graphic Novel category. This year’s winner, only the second since the category was created, was the amazing debut graphic novel by Adam Hines, Duncan the Wonder Dog: Show One. Dash Shaw’s BodyWorld and Jim Woodring’s Weathercraft were also nominated, along with You’ll Never Know Book II: Collateral Damage by Carol Tyler and Karl Stevens’ The Lodger. (Both Tyler and Stevens were guests for the earlier Graphic Memoir panel.) Last year’s Graphic Novel Book Prize winner was the worthy Asterios Polyp by David Mazzucchelli. The LA Times Book Prizes were awarded Friday night before the first day of the Festival. For more pictures, see my Flickr set.